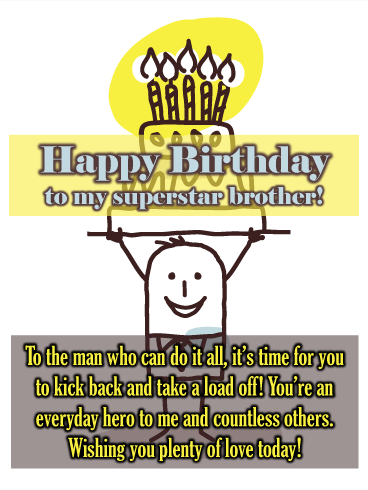 If you want to impress your brother this year, send him this stylish birthday card! It features a fabulous cake with decorative candles that are lit in honor of his big day. Nothing says a birthday is taking place more than a birthday cake, and that’s what makes this greeting card so special. Be sure to send it right away, while the candles are still lit! Question. Who has a smile for miles and all of your love? Answer: Your brother!! 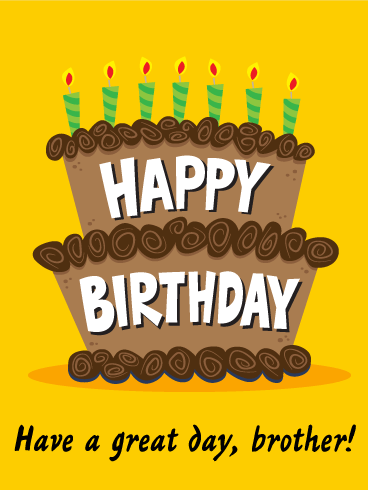 Send that awesome guy an equally awesome birthday greeting with the Smiley Guy Happy Birthday Wishes Card. Let him know just how much you appreciate him always having your back and that you’re hoping he has the most fun day ever! Shine on, brother man! 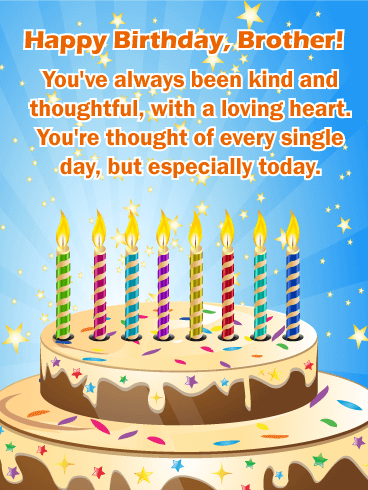 This year, lift up your brother’s spirits by sending him the Cake Lifter Happy Birthday Wish Card! Your brother is a superstar in his everyday life, a real hero to you and others. He deserves to enjoy a day of relaxation and appreciation. 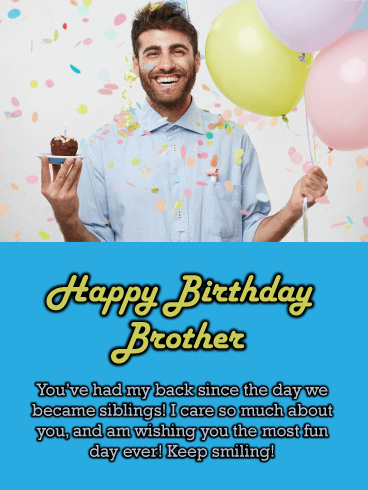 With a charming, grinning cartoon character lifting a big, layered birthday cake over his head, this card will definitely make your favorite bro smile wide! Nothing makes a birthday more special than an irresistible dessert! That's why this birthday card will be such a big hit with your brother. It features the best dessert ever and he will wish it was real! The birthday message expresses that you wish him lots of goodies, presents, and of course, a birthday song too. All of these elements, along with the festive yellow coloring and special Happy Birthday lettering, create the perfect birthday card! 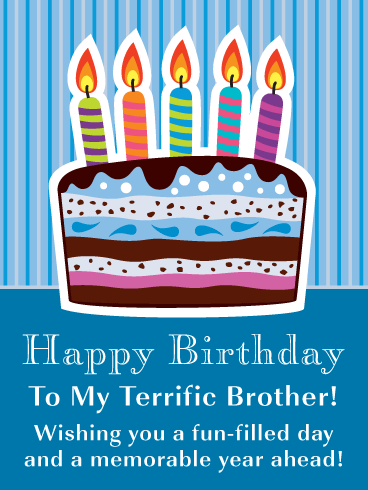 Let your brother know how you feel about him with this thoughtful birthday card! It will make his day when he reads that you are proud of him and all his accomplishments! 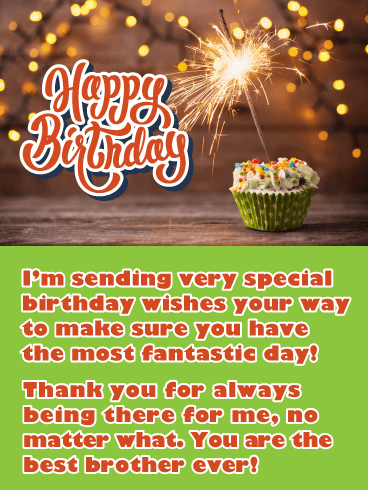 This birthday card displays a wonderful cupcake with lit birthday candles, it will add a little excitement to his day. It will also wish your brother a successful and fun year! He couldn't ask more! 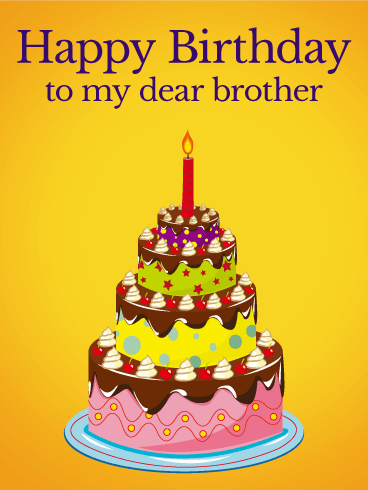 Let your brother know just how sweet you can be with this festive birthday card! An orange cupcake is topped with frosting and sprinkles, as a sparkler adds a brilliant touch. With a meaningful message above to wish him well, it's a wonderful opportunity for you to let him know you're surrounding him with love on his special day. Hey brother hey! 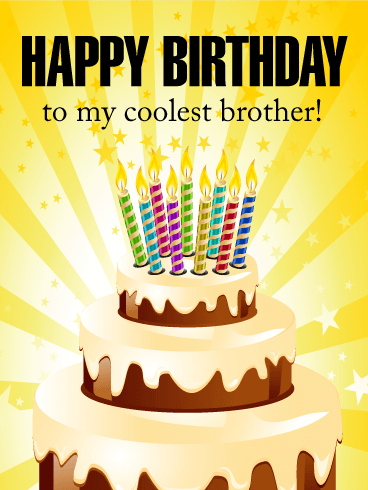 Check out this hip birthday card for your fantastic brother. You get to be sappy on your brother's birthday, so take advantage of the chance to tell him how thankful you are for him! 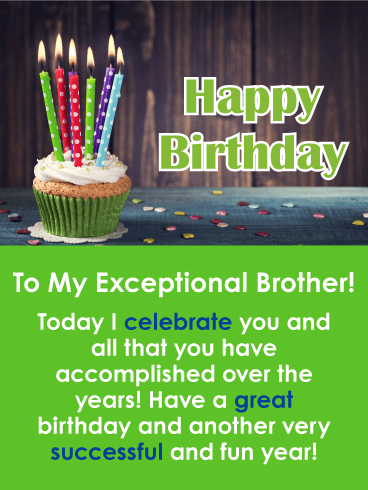 If you and your brother make a great team, if you hang in there through thick and thin, good and bad-this is the perfect birthday greeting card for your brother! Super thoughtful and super fun, send it today and put a smile on your brother's face. A sparkling cupcake and gold glittering letters come together to create a spectacular birthday card designed just for your brother! The birthday cupcake features perfect frosting, sprinkles and a celebration firework sparkle. Very exciting! Not only does this birthday card look fantastic, it also has a touching message that lets your brother know that your relationship means a lot to you and that you love him, which will be the best birthday present he could receive. A birthday is a splendid occasion to tell someone special exactly how much they mean to you. This birthday card does just that. 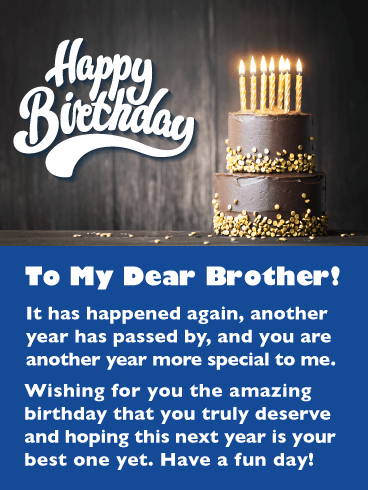 Tell your brother how much joy he brings to your life when you send him this birthday card full of loving wishes today and every day. A birthday cake, complete with festive icing and lighted candles, on a starry, blue background completes the happy effect. Your brother was your first friend in life, and he's still your best friend today. Of course you think of him every single day, but on this, his birthday, your thoughts of him are special. Let him know with this birthday card sending him a simple but festive birthday cupcake. 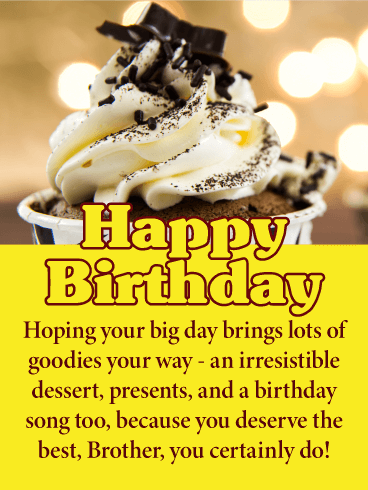 Your message is set on a yellow background, and the single blue and white checkered candle creates an entire birthday scene of lighthearted merriment. Simply delicious! Simply fun! 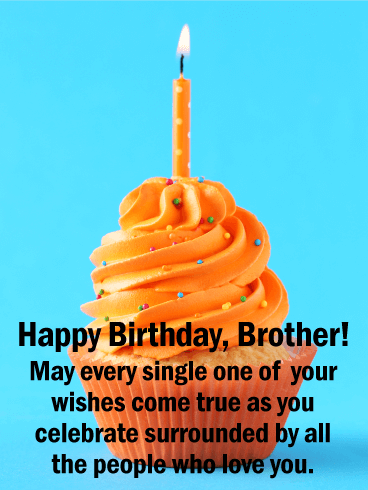 Send your brother a fun birthday card on his birthday to wish him a terrific day. A big birthday cake decorates this special birthday card for loveable brother. Don't forget to do something special for him this birthday, like sending a yummy looking birthday card to brighten up his day! Whether near or far, he will feel good knowing you're thinking about him when he receives this awesome birthday greeting. 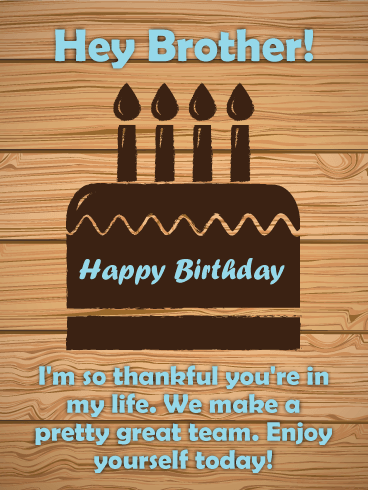 Celebrate your brother's life and another amazing year with this birthday card. He's come along way and his birthday is a good time to remember all the good times. 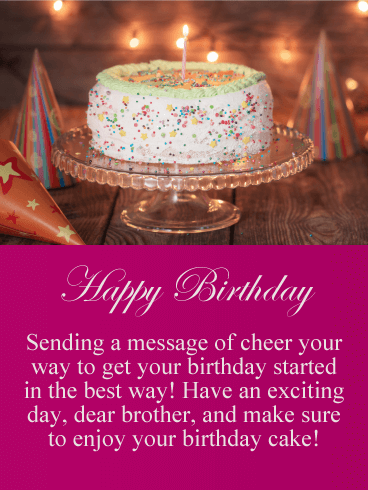 Wish a very happy birthday to your brother when you send a fun and thoughtful birthday card. The delicious cake and birthday presents on this greeting card make it a classic for any brother, young or old. Wish your brother a happy birthday! He deserves some extra fun in his life, so why not send him this festive and celebratory birthday card? It's a good time to take a moment and let your brother know you're thinking of him on his birthday. 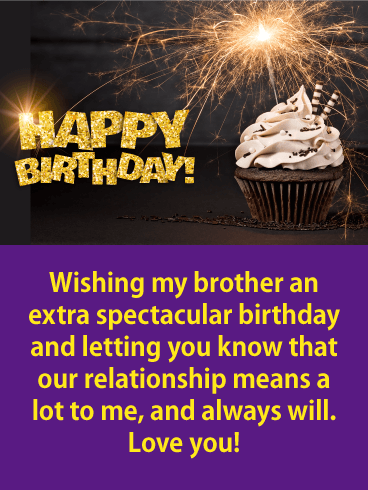 Send a birthday card to your brother on his birthday and you'll be sure to brighten his day. Your brother is one of the most special, cherished people in your life. As his birthday approaches, use this day to let him know what he means to you. The perfect way to let him know is through a fun Happy Birthday card! The stars and decorations on this card's cake will show that you think he is a shining star in your life and let him know you care. Send it today! Brothers are built-in best friends, protectors, and playmates. 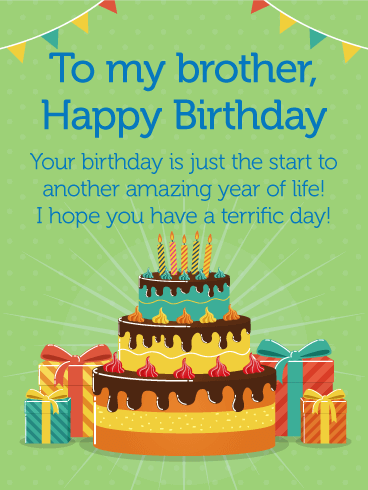 If you want to let your brother know how much he means to you, send him a fun Happy Birthday card on his special day! 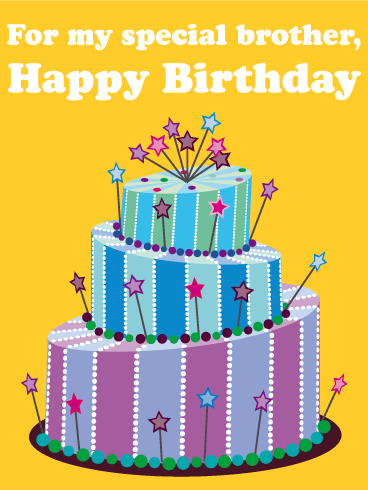 The bright colors, yummy cake, and colorful fireworks will be a great gift and celebration for his birthday. 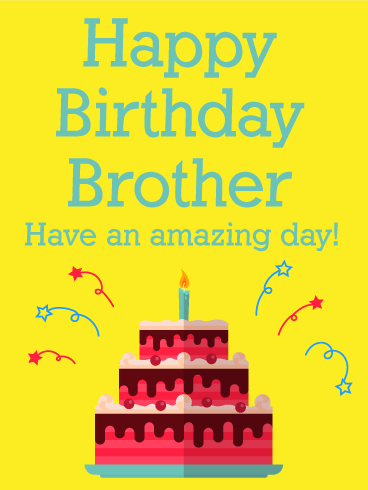 Wish your brother an amazing birthday by sending this birthday card today! A fun, vibrant birthday card, perfect for your brother's special day. A delicious cake topped with colorful candles will put him in the mood for party. Your cool brother will love you for this cheerful birthday card. 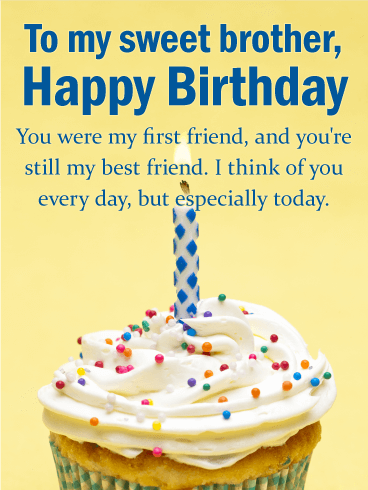 Offer him this birthday card today and make his celebration a fantastic one!